BLC_FULFILLMENT_OPTION FulfillmentOption Holds information about a particular fulfillment implementation. 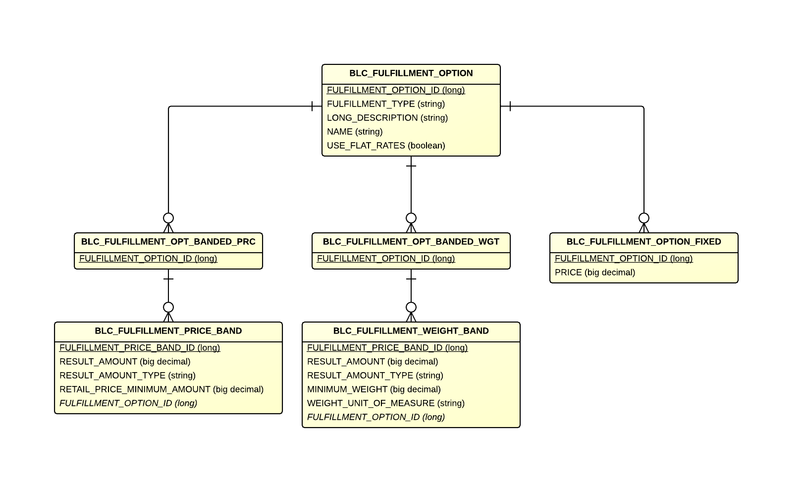 BLC_FULFILLMENT_OPT_BANDED_PRC BandedPriceFulfillmentOption Links to a list of Fulfillment Price Bands. BLC_FULFILLMENT_OPT_BANDED_WGT BandedWeightFulfillmentOption Links to a list of Fulfillment Weight Bands. BLC_FULFILLMENT_OPTION_FIXED FixedPriceFulfillmentOption Represents a Fixed Fulfillment Option. BLC_FULFILLMENT_PRICE_BAND FulfillmentPriceBand Represents a Fulfillment Price Band. BLC_FULFILLMENT_WEIGHT_BAND FulfillmentWeightBand Represents a Fulfillment Weight Band.